The dirigibug family is a family of enemies in Pikmin 2, and is currently consisted of a single element, which is also the origin of the family's name, the Careening Dirigibug. 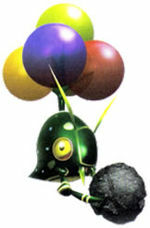 The Careening Dirigibug is an enemy found only underground in Pikmin 2. It has five balloon-like appendages that keep it suspended in mid-air. When approached, it pulls a bomb-rock out of its mouth and after a while, drops it, where it instantly become active and begins counting down. This page was last edited on March 2, 2017, at 13:07.